Check Please contains thirteen original songs with musicians Orville Johnson on dobro and mandolin, Tracy Knoop on clarinet and sax, Claire Wesley on recorders and Rod Bachman on bass. 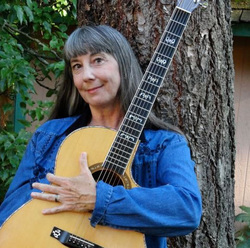 Kathye recorded all the guitar and vocals. Four of the songs have become know as the divorce suite: I Need a Dress for my Ex-husband's Wedding (hummed by ex-wifes every where), Sticks and Stones, Check Please, and Letting Go. Also included are two instrumentals-- Fairy Waltz with Annette Kruzic on cello and Cynthia Huber on flute, and an open tuning solo, Spring Thaw. Solo guitar instrumentals chosen for their grace and beauty by composers Tarrega, Bach, Sor and others. 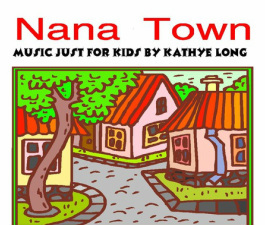 Ten songs, including three originals, recorded especially for your favorite little ones. Kid tested, Nana approved.